One of my blogger friends, Sarah at Journeys of the Zoo, told me about this great company making it easier for moms and dads to prepare toddler and kid food. I had no idea that a cutting mechanism like this existed, and I am so glad that FunBites agreed to send us one to try out, and to give one away in our blogiversary giveaway! 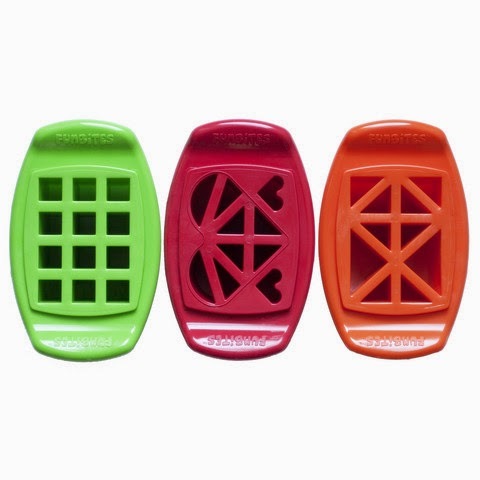 FunBites is the first state of the art kitchen tool that instantly cuts kids’ food into bite-sized, fun-shaped pieces. This product is made in the USA and is BPA free. They are perfect to get even the pickiest eaters to try something new and eat healthier. FunBites come in three shapes: square, heart or triangle. We chose to try out the square-shaped cutter. Lynley and Corbin have a bit of a problem when it comes to eating meat. They love toast and cheese so much, that I thought maybe they’d eat a grilled cheese sandwich with a tiny bit of meat hidden inside if it was cut into perfect pieces. Corbin ate a few pieces before he discovered that he was eating more than just bread, and Lynley basically just stared at her squares on the tray. Eh, better luck next time. But I did love how easy the FunBites was to use. It literally only took me seconds to cut the whole grilled cheese sandwich into a dozen pieces. That’s a huge win for a mom of toddler twins! I’m already imagining all of the foods I will use it on, and hopefully my tots will actually eat it! You can win a FunBites, along with a ton of other cool prizes by entering our blogiversary giveaway below.